In August 2016, fewer coal miners were employed in the US than anytime in modern history: just 48,600. A year later, little more than 50,000 miners are working, but the industry is still in dire straits—layoffs and mine shutdowns have led to rampant unemployment in West Virginia, Kentucky and Montana. President Trump has taken credit for the few jobs that have been added, promising to end the “war on coal”—but in reality, the industry’s downward slide is all but guaranteed to continue. In stark contrast, renewable energy—solar power and wind farms especially—are booming. In the United States alone, wind added 15,000 jobs and the solar industry added 50,000 jobs last year, up an incredible 25%. With unemployment crippling coal communities, a seemingly simple solution arises: Why not offer ‘clean’ energy jobs in wind and solar to out-of-work miners? The answer is complicated, but ultimately, whether any state, red or blue, will see a clean energy job boom depends on economic factors, chiefly, whether renewable energy is cost-competitive with traditional fuel sources like natural gas or coal. Steadily-falling prices suggest the green jobs boom will likely continue, in spite of Trump’s environmental deregulation agenda. Unfortunately, the boom won’t reach everyone. 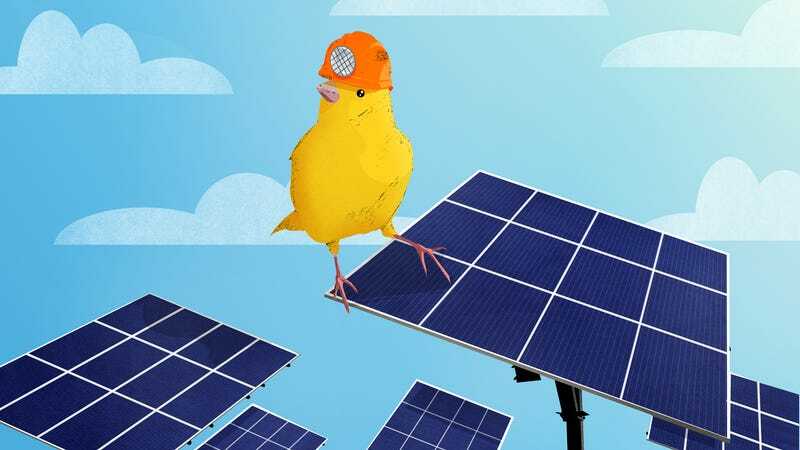 The first challenge in bringing clean energy jobs to out-of-work miners is geographic: Solar and wind jobs pop up in places where sunshine and wind are abundant. Sunny California leads the solar industry, with 40% of all solar jobs found in the state. Iowa, Kansas and South Dakota exemplify the potential for wind energy in the Midwest, with a quarter of each states’ total electricity production coming from wind. Even Texas, well known for its oil resources, produced 13% of its electricity from wind in 2016. But could solar or wind jobs pop up in major coal mining states, such as Wyoming, West Virginia or Kentucky? “It’s a mix of market drivers” that determine where solar jobs arise, says Philip Jordan, principal researcher for BW Research Partnership and co-author of the 2016 Solar Jobs Census. “But, the two biggest are... the cost of electricity you pay for the utility and then, what are the incentives and policies to promote solar?” People generally won’t care about renewables unless they’re provably cheaper than how they’re already getting their electricity, Jordan says. Generally, a state needs both natural resources—sunlight, wide, windy plains—and policies that tip the balance in renewables’ favor. When there’s no geographic overlap, out-of-work miners are forced to relocate, which is burdensome. A state like California, Jordan explains, has almost no coal or natural gas reserves (there’s only one coal-fired electricity plant in the state, and the state is cutting down on natural gas fueled ones), so utility prices are typically higher. Transitioning to solar lessens the costly reliance on out-of-state fuel resources, and pro-clean energy policies make renewables even cheaper. California subsidizes solar panel purchases for home owners and gives them money back if their panels generate more electricity than they’re using. This has led to greater demand for solar panels, and a strong supply of jobs. California’s solar push created 24,000 jobs in 2016, bringing the statewide total to 100,000. Contrasting this is a state like Kentucky, with abundant coal reserves. As coal reliance drops nationwide, Kentucky has been hit especially hard: coal jobs in the state are their lowest in 118 years. But solar or wind jobs still aren’t likely to spring up here anytime soon, because there’s little utility demand and few state-funded incentives to get people to switch their energy source. Most US-based jobs in solar are in installation, and there’s no need to install panels if no one has wants to buy them. Overall, coal-dependent states spend the least amount of money on clean energy incentives. West Virginia, for example, generates 96% of its electricity from coal and offers only 11 clean energy incentives, including net metering and tax breaks for wind turbines. Compare that to California’s 264 incentives. Mississippi, Wyoming, Alabama have around 40 incentives apiece, and Pennsylvania has roughly 70. A simpler way to put coal miners back to work, then, may be to find them jobs in the oil or natural gas industry. But is that less radical of a change? Geographically, there isn’t major overlap between coal and natural gas jobs. Colorado and Wyoming are really the only oil rich states that also have a sizable coal mining population. And skill wise, Jordan says shifting from one to the other isn’t always easy. Jordan raises a critical point: How can miners acquire the skills to start jobs in new energy sectors? As mentioned, about half of all jobs in the solar industry are installation, with manufacturing and sales jobs accounting for another third together. Similarly, installation accounts for a little more than a third of all wind jobs, while a little under a third of the jobs are in manufacturing, and 15% are in sales. What does it take to get a job in the most in-demand sectors? Chris Turek is a project manager and marketing director for Solar Energy International, a west Colorado-based nonprofit that holds solar training seminars across the country. Turek explains that, while they’re enthusiastic about training miners for new jobs in renewable energy, they don’t design training programs exclusively for miners who want to transition. SEI recommends at least two or three courses for those applying, coming in at roughly $2,000. The problem, of course, is that many out-of-work miners would struggle paying for this out-of-pocket or qualifying for loans. Still-working miners might fare better, but that would mean working a full-time job while attending training classes. And that’s only feasible if they don’t have to relocate for training. As Turek explains, workers in smaller communities require more training. Turek explains that, for smaller communities in Colorado or Kentucky, one solar worker is expected to handle numerous tasks, including prospecting sites for panels, designing and, ultimately installing them. Miners make great candidates for many installation jobs, Turek says, because their safety skills and electrical knowledge are easily transferable. But like all industries, moving up to more lucrative and varied positions in the field requires more training. A miner could easily train for a job at a manufacturing plant “in a few weeks,” Turek says, if they’re on an assembly line doing repetitive tasks. Sales, on the other hand, requires expansive knowledge of pricing, incentives, and local policies. Who pays for job training? Clearly, if we want to put coal miners back to work in clean energy, they’re going to need to be retrained. But who is going to pay for their education? The cost isn’t trivial. In 2016, Joshua Pearce, a Materials Science & Engineering professor at Michigan Technological University, estimated the cost of retraining coal workers for the solar industry. He found that it would cost the five most coal-dependent states between $120 million (“best case scenario”) and $1.1 billion (“worst case scenario”) to do so. An apprenticeship would cost around $18,000, while advanced degrees, enabling miners to become engineers or project managers, could cost over $136,000. The study assumes that lower-ranking miners would pursue apprenticeships, while seniors would go for degrees from top-tier schools. Pearce’s paper explores four ways coal miners could finance retraining for the solar industry. Miners could pay for retraining themselves, but that’s only feasible for still-working individuals who can afford to pay for training and apprenticeship on nights and weekends. Coal mining companies could pay for training, which might be more charitable than we could expect. Finally, the state or federal government could pay for retraining. In today’s political climate, state-level retraining programs seem much more plausible. Indeed, Trump’s 2017 budget proposed major cuts to both federal agencies spearheading clean energy research and deployment, the Environmental Protection Agency and Department of Energy. But even if the most severe cuts go through (which seems unlikely) there may still be hope, as federal efforts to retrain miners have typically come from the Department of Labor. Obama’s Hiring Our Miners Everyday initiative was funded by the DOL’s Training and Employment Services decision. Like the DOE, the DOL faces cuts, but nothing nearly as drastic. Still, if there’s real optimism to be found, it’s on the state level. Jordan points out that several states remain committed to clean energy, openly disparaging Trump’s insistence on delaying the inevitable transition. In the wake of withdrawing from the Paris Agreement, hundreds of cities have pledged to transition their municipal buildings to 100% clean energy by 2025. The governors of New York and California have also announced they’re committed to clean energy. Both states want 50% of their electricity to come from green energy by 2030. If these states accomplish even half of what they’re setting out to do, it’s going to mean a lot of new clean energy jobs over the coming decade. Will Trump help miners get jobs, or hinder them? The resilience of the energy marketplace means we can expect the green jobs boom to continue, particularly as coal dependence continues to drop and renewables get cheaper. And still short of a movement, companies financing retraining have been slowly popping up in coal country. The Chinese wind turbine manufacturer Goldwind wants to tap into ex-miners’ electrical knowledge and offer them training as wind technicians. Quick Mount, a solar panel installation company, partnered with SEI to offer workshops in West Virginia. Trump has proven his ability to galvanize the mining community, but if economists are correct, his environmental deregulation agenda won’t restart the coal industry. And if he doesn’t deliver on his promise of jobs, his approval among them could falter. At that point, it’s going to be up to coal mining communities, rich in natural resources and skilled workers, to decide for themselves what their future looks like and how they fit into America’s changing energy system.